There are a lot of ways to make candles. This is only one of them and it is fairly simple. You can get fancier if you want, but this is survival and preparedness, not a dinner party. As such, I have not included instructions for colorants or scents. A jar … you can use anything from baby food jars to pickle jars and mason jars are great, I’ve used small jars that I got at a dollar store, but I’ll use a small mason jar to show you. I like jars because they have lids and can be kept dry but feel free to use anything such as a milk carton, a tea cup or an old washed apple juice tin. Wax: beeswax, paraffin, old used candles anything! I’ll show you how to use recycled wax since it’s easy and cheap. Paraffin is easily found at a grocery store with the canning supplies (it’s not usually used for candle making but will do in a pinch. It has a lower melting point than candle paraffin that’s all) Pictured: old candles about to be chopped. Wick: I buy these from a wholesaler but you can get them at craft shops or make them with string but the string doesn’t work as well as a proper wick. The easiest thing is to use a wick that has the metal piece at the bottom. Pot and bowl: I usually use a container specifically for melting wax but most people will be fine with using a bowl over a pot of very warm water. You don’t want the water to be boiling over and you don’t want to heat the wax directly over a heat source because the wax can ignite at a very low temperature. Safety Notice: Hot wax can burn! If you get it on yourself, run cold water over it and then peel off the hardened wax. If your wax catches fire while on the stove (never happened to me but you never know…) DO NOT USE WATER to put out the flames! Turn off your heat source and smother the flames with a pot lid or fire blanket etc. I shouldn’t have to say this but I am not responsible for what you do! If you hurt yourself during this project, you are on your own and I am not liable. Put a pot of water on the stove at a medium heat. Put bowl over the pot. 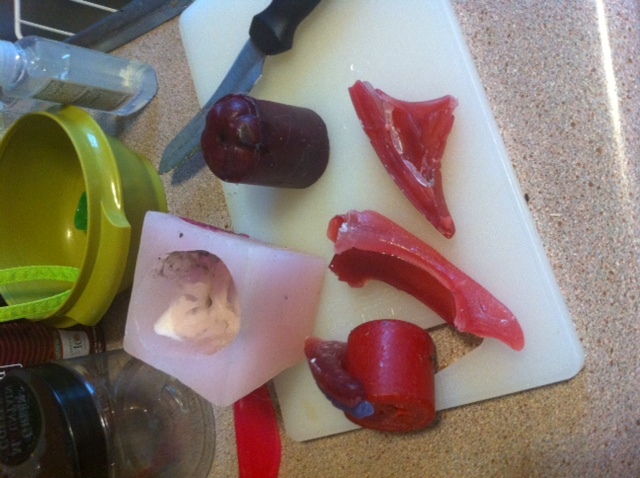 Cut wax into smaller pieces to allow quicker melting. Do not allow your wax to get past 170 degrees Fahrenheit. While the wax is melting, heat up your jars a bit. I usually use another pot of water to do this. You want the jars to be warm when the wax goes in to prevent the glass from cracking and to let the wax set nicely; otherwise it pulls away from the jar as it dries. When wax is melted, use a ladle or something similar to pour the wax slowly and gently into the warmed jars (make sure you dry them off inside first). Let them sit until hardened. (probably a few hours for all of the wax to be completely set. 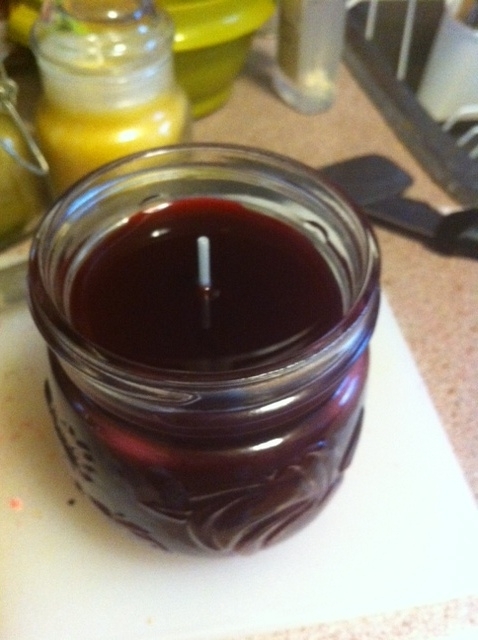 Pictured: my finished product… smells vaguely cinnamony (due to old candles being scented). Posted on January 5, 2012, in Uncategorized and tagged diy, jar candles, prepping, reusing wax. Bookmark the permalink. 2 Comments. This sounds pretty simple. I will save it for a rainy day project.